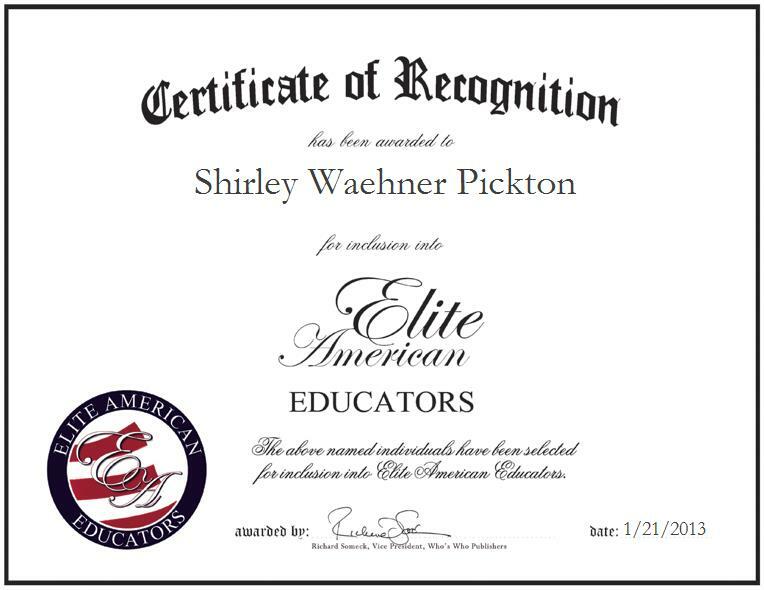 Company: The World Classroom, Inc.
DALLAS, TX, January 21, 2013, Shirley Waehner Pickton, Chief Executive Officer and President of The World Classroom, Inc., has been recognized by Elite American Educators for dedication, achievements, and leadership in academic program management. At her current post at the helm of the provider of explorations and global projects in the world classroom, including Alaska, China, Italy and the United States, Ms. Pickton encourages business participation and creates innovative self-discovery expeditions in which pupils of all ages engage. She specializes in communicating and encouraging all levels of students, community partners and parents to participate in the program, and in bringing out the best of each respective constituent through the plan. She utilizes creative marketing through film and print, serves as a unique program development facilitator, routinely motivates her students, and works with environmental and medical specialists. Ms. Pickton has garnered a reputation of distinction for her outstanding efforts over the course of a successful career, and she continues to strive for excellence in her every endeavor. She was chosen as a translator and hostess for the Olympics in Munich, Germany in 1972, and she was also named Finalist for the Teacher of the World competition in Greensboro, North Carolina. Additionally, Ms. Pickton was named one of the Top 10 Teachers in Texas by the University of Texas in 2003. The World Classroom is driven to effectively educate and directly impact under-privileged, inner-city high school students by providing travel and guidance to places around the world providing leadership skills, cultural awareness and the confidence to believe that they can achieve far greater than they ever thought possible. Ms. Pickton is currently a producer of educational films.